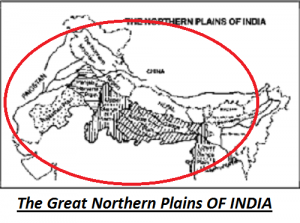 The Great Northern plains are located on the south of the Himalayas. They are covered by the Himalayas in the north and in the south they are covered by Deccan plateau. The Great Northern plain stretches for about 2,400 km from east to west. It stretches from 200 to 400 km from north to south. The total area covered is about 5,80,000 square kilometers. The Great plain of Northern India formed due to sedimentation process in which sediments are brought down by the rivers mainly Indus-Ganga-Brahmaputra and their tributaries. This Plain is popularly known as the Indo-Ganga-Brahmaputra plain.The plain came into existence due to formation of Himalayas in the north and the sediments were brought down by the rivers which began to accumulate there to form the Great plain of northern India. This plain is also known as Alluvial Plain. The Punjab Plain is the western part of the northern great plains. 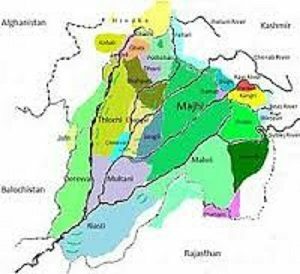 Punjab is derived from “Punch+ Ab” that means “land of five rivers”. Mainly the Indus river drains the punjab plain and its tributaries like satluj, Beas and raavi which lies in India. The Punjab Plain is made up of gravel, sand , clay cover etc. which is spread over the foot hills and are popularly known as “Bhabhar Plain” or “Bhabhar soil”. The Ganga plain is the major part of the Great northern plain and extends from the eastern Punjab in the west to Bangladesh border in the east of India. It covers major portion of states like Uttar Pradesh, Bihar and West Bengal.The rivers draining Ganga plain in north are Yamuna, Ganga, Ghaghara, Gandak, Kosi and in south are Tista Chambal, Betwa, Son and Damodar. The Ganga plain forms maximum delta in the plain and is the most populated plain in the country.